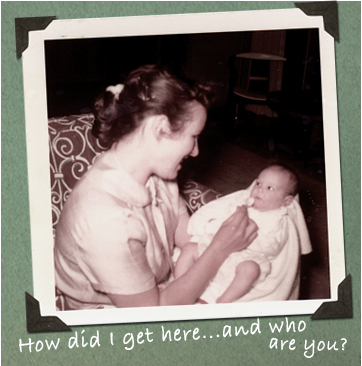 « It Matters to Adoptees How We Got Here! Volume III of Adoption Insight was going to be titled, Nurturing This Untimely Miracle ~ Insights for the Mother with a Crisis Pregnancy. It was going to dispel common myths, like the misguided one that says, if you are planning or even considering adoption for your baby, it is your “job” to begin the process of detaching now, while you’re pregnant… that it will make it easier to separate when the time comes. By “crisis pregnancy” I mean a pregnancy that is unplanned, ill-timed and/or unwanted; that may have been planned and then life circumstances have changed; that for any of myriad reasons is a source of stress for the woman. A mother doesn’t become a birthmother unless and until she makes a fully-informed, considered decision well after the birth of her baby… ideally without the subtly (or not-so-subtly) coercive hovering presence of prospective adoptive parents. More on this in future posts. I’m rolling out my 90s adoption writing in a fairly stream-of-consciousness way, without attempting to organize them by topic or put them in any certain order. (I tend to overthink everything, and don’t want to do that with this project!) This material will intersect and overlap, layer and hop around and generally just pour out in a big loving mess, with little gems hidden here and there. This is why, if you’re interested in these themes and issues, I encourage you to sign up at the bottom to be alerted to new posts. The following short piece was a personal story to open the Adoption Insight Vol. I booklet. (The closing Verrier quote is from Vol. II.) I learned later, from my birthmom Liz, that she had tried “living as if married” with my birthfather Bob in Santa Barbara for a few months before realizing it was not going to work. The name of the mutual friend who introduced Liz to my adopters Bee and Bob? Her name was Marcy Densmore, which is how I got this name. My original name is Katherine McDavid. I’m a good Scots lass! I also learned that Bee and Bob weren’t the first couple Liz “interviewed”: she had met a different couple, but deemed them way too uptight to raise her child. She said he had a pocket protector, and that really turned her off. This anecdote about her protective impulse—the only discernible maternal feeling she ever expressed having toward me—has stood as one of the most endearing things I learned from Liz during our almost-40-year relationship. And although I continually “absolved” her of the fact that her intuition had steered her badly—that life with Bee and Bob was deeply unhealthy for a child—Liz was really saddened to think I might have had a better life with Mr. and Mrs. Pocket Protector. A woman becomes pregnant by accident, and the crisis pregnancy puts a severe strain on her new relationship. The baby’s father, seven years older than his new girlfriend, has just recently left a marriage—and a young son—and isn’t about to get tied down again. The young woman navigating this crisis pregnancy decides that she should give her baby up for adoption. One of the woman’s friends introduces her to a couple who are hoping to adopt; they have suffered the loss of a baby, as well as the wife’s recent miscarriage. The pregnant woman and the couple like each other, they are a fit. The pregnant woman moves from Southern California north to a San Francisco apartment to be nearer to the Marin County couple. They find a lawyer to arrange the adoption. Sounds very ’90s, like a modern open adoption. Except that it was the ’50s, and it was my open adoption. For ten years after I was born, my parents Bee and Bob exchanged letters and pictures with Liz, my birthmother. It was a lot like many of today’s “open” adoptions, which I call quasi-open since all of the purported openness benefits the child little if the parents merely go through the motions of openness without becoming opened themselves—opened in their consciousness of the birth mother’s experience, of their child’s losses and needs, and of their own history of loss. Opened in their hearts and souls to the presence of emotional truth. Mom once told a mutual friend that she “never knew how to deal with adoption very well.” I was seven when she summoned her courage for our one and only “adoption talk”—more of a speech, by her. She told me how much she and Daddy loved me just like their own, but that I had come from another mother who couldn’t keep me but how delighted she and Daddy had been to bring me home because they wanted a little girl exactly like me. She ended by telling me that if I ever had any questions I could always ask. As a sensitive, compliant child will do, I sensed Mom’s deep discomfort at the subject and never allowed myself to even form the questions. She had fulfilled her uncomfortable obligation of honesty, and there was never again any further mention of my adoption. My adoptive parents did “the best they knew how” as the saying goes—what they thought was right and good, what was in their limited emotional capacity to do, what they were told was okay to do. And indeed, we didn’t know then what we know now about the consciousness and feeling capabilities of tiny babies, even before birth. How could they know I came to them with a deep wound of separation that needed to be seen and empathized with? If [the adoptive mother] is really alert, if she is truly attuned to her child, she will notice the sadness, the pain, the fear. The Adoption Insight Vol. I booklet Painful Lessons, Loving Bonds ~ The Heart of Open Adoption, is available here... ….. This entry was posted on Monday, August 13th, 2018 at 5:00 pm	and is filed under Adoption Insight. You can follow any responses to this entry through the RSS 2.0 feed. You can leave a response, or trackback from your own site.